Home » 1930s » >A Colorful Blouse, circa 1937, to match my shoes! >This weekend my husband and I went thrifting, and I nearly squealed with delight as I found a pair of Farylrobin shoes in my size! And they were a pair I had wanted and are now nowhere to be found! I think I grinned the rest of the day. Actually, I’m still grinning. :) Just to show how much, I dug in my fabric stash and came out with a blouse of three color combination to wear with my snazzy new-to-me shoes. 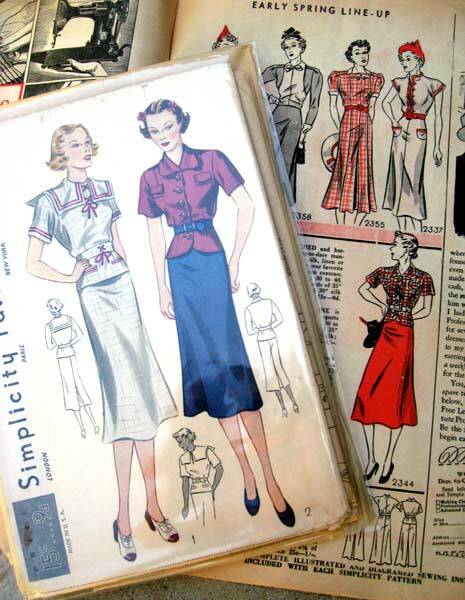 This project was from a pattern I’ve had in my stash for years and years, Simplicity 2344, which I found in a vintage Simplicity pamphlet that featured it in March 1937. I actually even bought this robin egg blue linen to make it with some two or so years ago! At first I wanted to make it blue and brown- very classy and very 30s, but the shoes were the inspiration so I just ran with it. 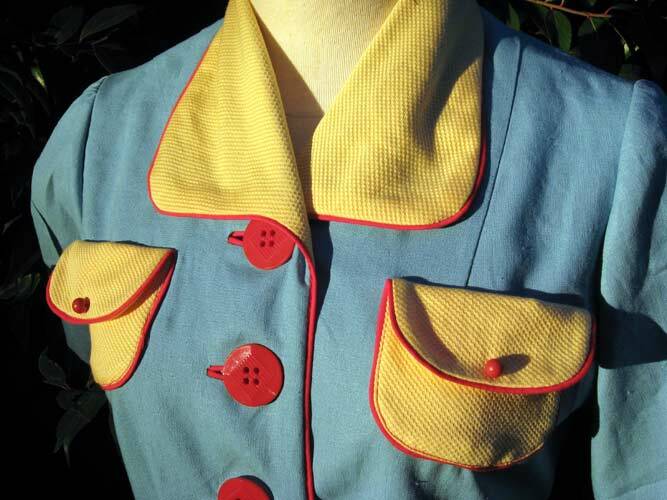 I bought a yellow pique on sale at Fabric.com a while ago, so pulled that out, then remembered I had bright red piping and big red buttons (they’re new, but don’t they look vintage? Every once in a while Joann surprised me with their offerings), so it was meant to be. Now, part of me thinks this looks rather romper room or clownish, but then I remember the mad 1930s color combos I’ve been sharing in the way of catalog scans and my pre-school visions are calmed and replaced with gals jitterbugging in late 30s movies- or the wild color shorts like Starlit Days at the Lido (1935), which I linked to before, or the short of the Star Night at the Cocoanut Grove (1934). This was pretty simple to make up, the the pique did prove to be a bit of a challenge. It’s probably a mid-weight, so has a bit more body than I’d like, and does have a loose weave and a bit of stretch in it, so doing the inside of my bound buttonholes was a bit of a chore- but heck- no one can see them but me, so no biggie, right? I am actually quite pleased with my skills of a stretch fabric tamer, since stretch fabrics really are my arch nemesis. 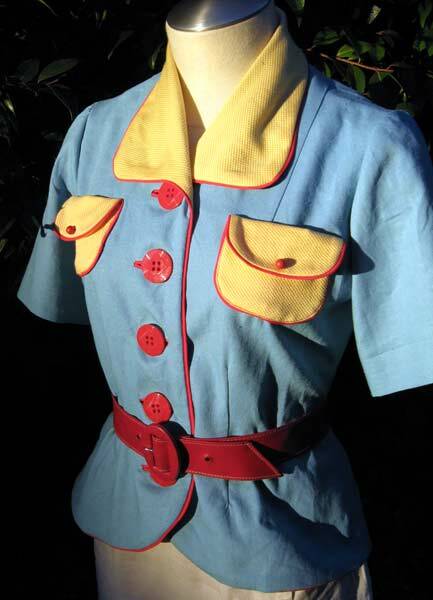 The story of this blouse isn’t finished yet, as I’m waiting on some more yellow pique to arrive in the mail so I can make a skirt and I have a vintage red belt buckle coming as well, so I can make the matching belt. Now I just need an excuse to wear it! 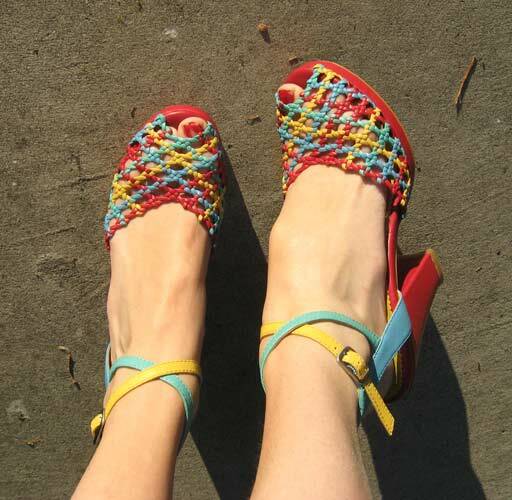 24 Comments on >A Colorful Blouse, circa 1937, to match my shoes! >What a lovely top! Very mad 30's color, just wonderful. I hate stretch, too. Vicious stuff. >those SHOES! Oh, they are gorgeous! >Amazing – I'd love to see the whole ensemble on you! I'm not normally a shoe girl, but that pair is absolutely divine. >I love it! And it matches the shoes perfectly! >Oh my! Those shoes are to die for… Love that blouse too! >Who's afraid of red, yellow and blue? Great top and and I'm green with envy on those shoes, they are a dream! >You're one lucky…… & clever lady. Those shoes are simply WOW! You must post a picture of you wearing the whole outfit once it's done. Prosit! >fantastic! love them, love them! >Eeeee! Lovely lovely shoes, totally deserving of a new blouse. >eeeeks! PERFECTION, Lauren!! Totally meant to be! >I'm totally in love with your shoes. >Perfection! Love the blouse and the shoes. >i am so in love with that top!! >Oh my stinkin' heck. I'm DYING over the shoes AND the top! >Wow, I love it! Can't wait to see the whole ensemble! Oh, and since you're sharing some great pics, have you also seen what other's are stitching up over at http://www.WeAllSew.com?